Here’s a great list for all those educators out there looking to use more Web 2.0 tools in the classroom. Great Web 2.0 tools for a variety of topics, explained using Glogster. Interested in the field? Already in it and looking for a new source of ideas and information? 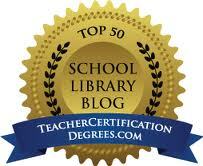 These are some truly excellent blogs by prestigious school librarians, compiled by teachercertificationdegrees.com. E-books have revolutionized our way of reading and our idea of what reading is. On the subways in New York City, in parks, on lines and in waiting rooms, people are carrying mobile reading devices and soaking up their favorite genres. Even billboards and television commercials are advertising the pleasures of e-reading! Surely this bodes well for the library, an institution dedicated to information seeking and information retrieval. In the 21st Century, libraries must keep up with the latest trends in technology and find unique ways to integrate this technology into the library. For e-books this includes development and management of e-book collections, integration of e-books into services, struggles with e-book licenses and lending procedures, and an understanding of how e-books are changing the lives of patrons. Specific steps must be taken to establish a successful e-book collection and management. Lisa Carlucci Thomas and Holly Tomren, two successful academic librarians from Southern Connecticut State University and the University of Georgia, have developed a comprehensive, quick guide to e-book collection development and how to maintain it. Firstly, the librarian must do research on e-book formats and their compatibility with mobile devices, mobile apps and platforms (Thomas & Tomren, 2010, p. 36). For example, e-book format AMZ is exclusive to Amazon’s Kindle and cannot be purchased by a library, but EPUB and PDF formats are plentiful and work with many other e-readers such as Nook, iPad, iPhone, CruzReader, SonyReader, etc. (“Overdrive”, 2011). Advertising a chart or list of e-readers that are compatible with the library’s e-book collection is advisable. It is also important for the librarian to investigate the various publishers and packages available for library purchase; subscription vendors popular with public libraries are OverDrive, NetLibrary, and Ebrary. This collection should be centered on patrons’ wants and needs. Librarians should order e-books based on patrons’ immediate desires, use direct invoicing, and especially use priority processing and immediate activation of e-books. Sometimes e-books and print materials are ordered from a vendor at the same time—this is a mistake. The ordered e-books will usually be processed and activated at the same rate as the print materials, which could take weeks! Ordering these resources separately is much more efficient. When the e-books are finally ready and cataloged in the system using national standards and necessary metadata, the librarian must create plenty of access points for patrons in the OPAC. If e-books are not prominent, many patrons will be less likely to use or search for them. The next step is to convey the benefits of e-book collections to staff and patrons and to integrate e-books into services and instruction, such as reference and technology workshops (Thomas and Tomren, 2010, p. 36). The more a library pushes their e-book collection, the more likely patrons are to utilize that service! Preservation and management are the final and key steps to e-book collection development. E-books must be preserved and data migration issues must be fixed. Dialogue with other librarians who have preserved e-books and ironed out data issues is always helpful. Instruct staff and users on how best to optimize e-book resources. Predict and prepare for future possibilities of e-books and their growth in the library field (Thomas & Tomren, 2010, p. 36). This technology will only become more advanced; though e-book collections are a huge project, they are necessary for today’s patrons and must be established quickly, as technology will certainly evolve even more quickly. Unfortunately for the librarian who has developed the e-book collection, there will always be texts that patrons want that are not available in the library’s catalog. In such an instance, the librarian should recommend websites for free e-book downloads and put up posters of these websites. InkMesh is a free search engine that sifts through approximately thirty different websites that offer free e-books. Project Gutenberg offers tens of thousands of free e-books in all compatible formats, even Amazon’s Kindle format. Most of these e-books are classics or public domain. Baen Books is a science fiction / fantasy publisher whose website offers select free downloads of their books. The Online Books page from the University of Pennsylvania provides an index of free books to read on the internet, though they are not downloadable for a mobile device. Lastly, eBookFling sprung up from the new feature on the Kindle and the Nook that allows readers to lend their e-books; patrons can connect with users from across the country and lend or borrow books for free. Additionally, the NetGallery website allows professional readers, such as library staff, to download free e-books (Vnuk, 2011, p. 48). E-book readers and librarians would benefit from reading up on everything e-book, from reviews of books and readers to the struggle between publishers and libraries over e-book licenses. Blogs are an efficient way to stay informed. Prominent blogs about e-reading are The Digital Reader (news, reviews, and opinions about e-books and e-reading) and Ebookanoid (reviews e-books, e-readers, and websites devoted to them) (Vnuk, 2011, p. 48). Furthermore, No Shelf Required is a blog about e-books and e-reading that keeps librarians and publishers informed about the e-book debate; libraries and their triumphs and tribulations while negotiating with publishers and integrating e-books into services; and the latest library conferences and what they mean for the e-book industry. In spite of the depression, or rather because of the depression, patrons are looking to libraries for resources. User demand for e-books is surging. Sarah Rosenblum, a librarian from Minnesota, has projected that almost half of the budget for her small library in Hennepin County will be spent on e-books within the next five to ten years. In 2010 approximately $35,000 of her budget went towards e-books; this year, $350,000 will be spent on e-books. Rosenblum claims that the plan to spend such an increase on e-books is due to the overwhelming success of the integration of OverDrive’s subscription service in her library (Albanese, 2011, p. 6). However, library success with e-books has not been without great struggle. Formats and licenses are easily jumbled, and none seem to want to cooperate with libraries. OverDrive’s audio formats only work specifically for Windows or Mac, and there is no transference between the two devices. Publishers put up roadblocks for public libraries trying to buy e-book licenses. HarperCollins publishing, for example, implemented a new policy in early March that allows libraries to buy a license for an e-book, but that book may only be borrowed 26 times. After this, the e-book disappears from the system! The library must buy the license again if it wishes to lend the e-book again. Publishers are at war with everybody: Amazon over prices, libraries over licenses, and authors and agents over royalties and rights (Minezesheimer, 2011). HarperCollins advocates against selling complete, unrestricted licenses to libraries with the claim that it would undermine the e-book ecosystem, place more pressure on bookstores, and lead to a decrease in authors’ royalties. HarperCollins sounds so selfless. But they fail to see that their actions undermine their own business. Recently, Amazon has allowed libraries to license their e-books in AMZ format for the Kindle, the No. 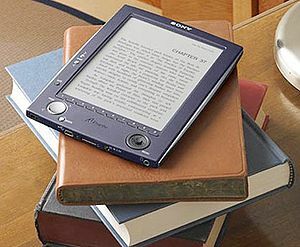 1 selling e-reader. Who knows how this development will affect libraries and the e-publishing industry in general? In the end, it would be more beneficial for everyone if libraries had equitable access to all electronic content in all formats (Minezesheimer, 2011). The Chief Officers of State Library Agencies (COLSA) was concerned with the format compatibility issues between libraries and mobile devices and decided to conduct research on how best to go about solving it. The original goal of COSLA was to create an e-reader for library patrons to use and circulate, but the agency decided that there were too many e-readers out there already; a more suitable solution would be to open the gates between e-book formats and e-readers for libraries. COLSA believes that libraries should have a “stamp of approval” format that works with all e-readers. COLSA suggestions for public libraries include finding a low-cost way to lend devices through the library, improve the ease of e-book lending, expanding access to e-book collection and national buying pools, and using leverage with publishers and vendors to lower prices (Porter & King, 2010, p. 21-22). An all-out license for public libraries would certainly solve most of the e-book problems and eliminate much of the e-book debate, but attempting and implementing such an idea will be tedious because of the many uncooperative parties. The real question is, why is it so important to develop e-book collections in public libraries? Who would these e-books benefit? Scholastic, Inc. conducted a study on kids and their reading habits in September of 2010. Mobile devices such as cell phones have seriously affected the amount of time that kids from ages 9-17 spend reading (41%), doing physical activities (40%), and engaging in family-time (33%). On the bright side, 57% of kids in this age group say that if they had access to e-books via an e-reader they would read recreationally more often. Part of the reason these kids do not already use e-books is that only 6% of parents own a mobile e-reader, though 16% plan to purchase one in the next year. Of these parents, approximately 83% say they would share their e-reader with their children (Scholastic, 2010). The message to parents is that if you want your children to read, buy e-readers and use this technology to promote reading. However, the study does not address the fact that many cell phones are e-reader capable. Barnes and Noble’s Nook and Amazon’s Kindle offer applications that are free to download onto mobile devices; these apps allow users to download and read e-books on their phones. Nook and Kindle also have apps that are downloadable onto a computer so people can e-read from a PC or Mac. Perhaps kids and parents are unaware of these capabilities, in which case more effective advertisement is needed. If it is lack of access to mobile devices that is the issue, the library can provide a solution. If libraries offer circulating or non-circulating e-readers for in-library use only, these kids would have access to the mobile technology they desire and would hopefully take full advantage of this service. E-books must be integrated into the library because of patron demand. The e-book collection must be constantly developed and efficiently maintained to comply with patrons’ needs. Library services should have e-books integrated into them, such as the OPAC, reference services, and instruction. The popularity of e-books and e-readers is increasing, prodding librarians to devote more of their budgets to e-book collections and forcing librarians to struggle with subscription vendors and publishers to gain full e-book licenses. The solution would be for libraries to have complete access to e-book licenses for the good of the people. Kids are already proving how valuable e-books and e-readers are to learning and reading; library services that integrate e-books and e-readers into services would better meet the needs of the public. As this technology continues to change and grow, librarians must pioneer this technology into action in order to keep libraries current and relevant to citizen’s lives. Albanese, A. (2011). Librarians brace for a tough 2011. Publishers Weekly, 258(3), 6. Menezesheimer, B. (2011, March 7). Librarians launch boycott in battle over e-books. USA Today. Retrieved from http://www.usatoday.com/life/books/news/2011-03-08-libraries08_ST_N.htm. OverDrive, Inc. (2011). Device resource center. Retrieved from http://www.overdrive.com/resources/drc/. Porter, M. & King, D. L. (2010). E-books, e-book readers, and next steps. Public Libraries, 49(6), 20-23. Scholastic, Inc. (2010, September 29). New study on reading in the digital age: Parents say electronic, digital devices negatively affects kids’ reading time. Scholastic Media Room. Retrieved from http://mediaroom.scholastic.com/node/378. Thomas, L.C. & Tomren, H. (2010). Ebooks: Think mobile. Computers in Libraries, 30(10), 36. Vnuk, R. (2011). Free e-books for happy patrons. Public Libraries, 50(1), 48.